Demystifying Design: An Interview with Tiffany Tseng at the MIT Media Lab | What Is A Media Lab? J: Tiffany, thanks so much for taking the time to sit down with me. For those that aren’t familiar with you or your work, would you mind explaining your role at the MIT Media Lab in detail? Can you describe your research interests and current projects? T: Sure! I’m Tiffany Tseng, a 5th year PhD student here in the MIT Media Lab. The MIT Media Lab is broadly interested in how humans can use technology as a tool to empower new expression or new ways of living. Essentially, we reimagine how humans might live based on new and developing tools. And that’s pretty broadly defined, so we have groups here that work on everything from prosthetics, to how children learn, or thinking about interfaces—for example, how computer devices might reach beyond keyboard and mouse to adopt virtual reality or gesture-based interfaces, etc. I’m based in the Lifelong Kindergarten group, which is particularly inspired by how children learn in Kindergarten—where things are open, collaborative, and people can really explore with materials—and bringing that openness to people of all ages. Our group thinks about creative learning experiences that involve people actively engaging in design. That has a broad spectrum as well; my colleagues are working on programming as a tool for creative expression. There are also people interested in making in the physical world, which fosters projects combining on-screen interfaces with physical objects. My work in particular is focused on how people capture and share the physical projects that they make, helping people bring to light different design iterations, and showcasing what it means to engage with design. The ultimate goal is to help empower new audiences to participate. I think that when we’re really transparent with design, it demystifies the process—makes design a less scary and intimidating endeavor. It makes it seem less like there’s a genius designer that comes up with an idea in an instant. Our group wants to showcase the iterative creativity that goes into responding to unexpected challenges in a project. My current research projects are both rooted in this concept. I’m the main developer for Build -in- Progress, an online community built to visualize design and showcase how projects evolve throughout time (see Image 1), and the Spin, a turntable system for creating playful animations of design projects (see Image 2), thinking about documentation, and engaging in visual methods of capturing experience. J: I’d actually like to begin by discussing Build -in- Progress since it’s a tool I’ve used in my own work. I’m interested in how that project was conceived and built. In a previous conversation, you had mentioned you almost felt like a faux toolbuilder in the beginning stages, and that you didn’t anticipate the project taking off the way it has. So how did it begin for you? What inspired you? How does something like Build -in- Progress happen? T: Before Build -in- Progress, I had been working on different methods for people to capture what they create in ways that enable others to learn from their experiences. When I was at Stanford before I came to the [MIT] Media Lab, actually, I started getting involved in the School of Education. My jumping-off point was thinking about physical constructions and what people make with their hands. So, for example, when kids build with Legos, usually they’ll build really interesting and amazing things with physical construction kits. But when they take it apart afterward, the knowledge of what went into creating it—or even what they made in the first place—often isn’t captured. I wanted to help people capture projects in ways that help them remember what they made—assemble a portfolio of what they’ve created—and in ways that help facilitate feedback and dialogue. When I was starting at the Media Lab in 2011, I started looking at the DIY community, specifically at Instructables, which is a popular site for people to share DIY tutorials. I interviewed people that wrote Instructables to get a sense of how authors thought about what they created on the site. I also did a survey with users to delineate how people used the documentation they found to support their own making. And essentially, what I found was a discrepancy between the format of the site and how people use it. Instructables is set up so that documentation is compiled after a project is made; someone goes through a process of making, and after, they write up step-by-step instructions that would help someone else recreate it. And I discovered that users were altering the Instructables they found, substituting different materials or tools. I found that users derived a lot of joy from changing instructions they found—personalizing it so that it became meaningful to them. Unfortunately, there weren’t many ways for them to share these modifications on the platform due to the separate nature of sharing instructions and leaving comments. So that’s where my thinking around Build -in- Progress starts. I began to think about what a platform might look like that enables people to share how a project evolves and what it looks like when we actually go about creating, which is usually not a very straightforward process. There’s a lot of innovation that goes into it, a lot of setbacks, experimentation—but the tool also helps people capture what that process looks like as they’re still developing. I think there could be a really interesting dialogue between creators and users that informs how a project comes to be and how it gets shaped over time. And I think in some ways, people are less receptive to changing a design after they’re done with it. That was my general inspiration. J: Did you have much experience designing web platforms? T: Actually, my background is actually in mechanical engineering and hardware, so web-design was a very new space for me to enter, but I found a really amazing mentor in my group to help me anticipate those challenges. I actually have a project on Build -in- Progress that documents my personal process of learning how to make the site. J: You’ve been discussing real-time feedback as being incredibly useful, not just for BiP users, but for yourself as a tool-builder and developer. I’m interested in how the BiP tool was maybe used in ways that you weren’t initially anticipating, and how your original design vision has transformed in response to that. T: There have been a lot of changes! I’m of the mindset that designers should just put a project out there, see what people do with it, and use that response to inform how it evolves. A lot of changes have made to the BiP project page in particular. When I first started the site, I intended the branches to be used for separate iterations. So, you try out one version of the design in the first branch, and then you decide to change it, that gets represented in the second branch. But actually, when I first started BiP, there was a lot of project collaboration with after-school centers, focusing on really young kids capturing their process of creation as it occurred in real-time. What I ended up finding was that it can be a real trade-off between the amount of time it takes to document and the amount of time it takes to create the project. What I learned very quickly was that if you want to support people sharing multiple iterations, it needs to be in a space where they have the time to iterate. And by time, I mean a few days or weeks to develop a project. 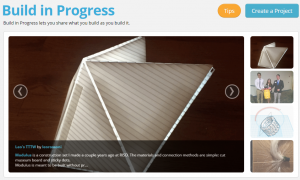 That didn’t happen much in the beginning; kids might be building something in, say, two hours, so you would get step-by-step narratives similar to Instructables. As more audiences found the site, they started using the branching feature in different ways than I’d originally designed it. Very specifically, my thought going into it was that the feature would be used for different iterations. But for example, a lot of schools ended up using it for student group projects, so about a year and a half in we added a feature to add multiple authors to a project. Users began using the branches to show different people’s contributions. Also, the types of projects that I was documenting were typically in the more traditional DIY space. People ended up using branches to separate elements of a project that they were working on simultaneously. So for example, in a physical computing project, there could be fabrication elements. But then there are electronic elements or software elements, which get represented in different branch. Branch usage definitely evolves over time based on the audience. Additionally, I just redesigned the homepage. Many DIY sites only share finished work, presenting a static grid of images. And those don’t change very much, because when you share the project, it’s done. But at BiP, a lot of the projects are still under development, so the latest uploaded image might change daily. Now on the homepage, you can see a time-stamp of when a project was actually updated, so it doesn’t seem quite as stagnant as it might have even a week ago. And as sole developer, I can think of and enact these changes pretty quickly. J: I’m fascinated to learn that you come from a hard sciences and hardware background, but have stumbled into what I consider to be a humanistic field of study. Do you consider the MIT Media Lab a humanistic space? Do you find it difficult to straddle multiple disciplines? And to what extent would you now consider yourself a humanist? T: The intention of the MIT Media Lab is to think about the intersection of humans and technology. I think the humanist element is built into every group here in very different ways. Lifelong Kindergarten in particular is very interested in how people learn and use technology as a learning material, so it starts with people. We’re interested in supporting learning experiences on a shorter timeline than other groups, who might be developing a technology that couldn’t be reasonably employed in the world for another twenty years. It’s not that we aren’t future-facing, but that we’re interested in making an impact in schools and communities today. We’re very user-centered and focused on reaching out to communities. We have a lot of community partnerships, and that helps us not only understand current practices, but deploy the projects we’re working on to larger audiences. It’s a collaborative work space where interdisciplinary scholars use the facilities, but also to talk to other people, which is so important for development work. Now I’m doing a lot more writing since I’m trying to write my dissertation, but I still come into the lab every day. J: So a typical day in the life for you, then, normally includes a stop by the lab. That’s interesting, because when we were interviewing digital scholars, physical space wasn’t always important to completion of the work. T: The physical space is super, super important. There are two lab buildings here: half the groups are in the new building and half the groups are in the ‘classic’ building, as we call it. I’m in the new Media Lab. One thing that went into the design of the space is to try to make it as transparent as possible. There’s a lot of glass, and the labs are structured so that they’re open and shared among multiple research groups. The idea is that when you walk through the lab, you’ll get to see what other people are doing just by walking through the space—just by physically seeing what’s going on—with the hopes that it would foster collaboration. I think most of the collaborations in the lab come from students taking classes together and working on projects. All classes are project-based (there are no exams). The lab creates space for overlap, and the physical space is definitely designed in order to accomplish that. I myself collaborated with other students early on when I was taking classes. I wish I were sitting at my actual desk (see Image 3): I literally sit right next to an electronics bench, and right behind a 3D printer, and an industrial sewing machine—which I don’t use personally—but I’m surrounded by all these materials, and that has helped me so much over the last year. J: How much group collaboration is there in the lab space? How often are you in communication with workers in other groups, or asking them for help on a project? I know that the work is very different, as you were saying before, but I’m interested in whether those conversations are happening at the lab. T: A lot of collaboration ends up happening really informally–between people that you took classes with, or that are within your cohort, or people that are using somewhat similar technology. Or even people working in a somewhat similar space, maybe collaborating with the same corporations or community organizations. As an example, a student in another group works on opening up electronic design to broader audiences, and she has developed a product that helps you make interactive paper creations from circuits that you can use on paper and connect. It’s somewhat related to what I’m working on, but mostly we’re just partnered with similar people. It’s always helpful to get a different perspective and be able to brainstorm on different elements of your design. As another example, a student in my cohort and I collaborated on a construction kit project, which was my main research project in my first year. That kind of collaboration happens a lot for different students in the lab, but I would say it’s more organically grown. I wouldn’t say it’s top-down, where professors decide they’d like to collaborate on a project. It’s mostly just students. You have friends in other groups and you decided you’re both interested in something, and how fun would it be to work together? I do wish there was more collaboration between faculty. Our faculty are incredibly busy people, and to come together for a larger initiative is very difficult. It’s something that people are striving to make happen more often, though. One example that has recently come to fruition is a laboratory-wide well-being initiative. People are interested in how we can make the Media Lab a healthier and welcoming work space for both us within the lab and audiences outside the lab. That could come in the form of tools people make or papers people publish. But one simple result is that the well-being initiative has helped people eat lunch together in the lab. So the goal is not always research focused. J: How much of laboratory collaboration is driven by corporate interests? In our graduate Digital Humanities course this Fall , we read the Stewart Brand’s Inventing the Future at M.I.T. The text was published in the mid-80s, so it’s describing a very different space than the Media Lab you’re currently inhabiting. But to quickly sum, every single page is filled with new, amazing imaginings. In a way, the book was saying: if you can dream it, MIT can build it. But in another way, I think the text terrified us. One of my colleagues, Erin Cousins, wrote that the reading Brand was like “drinking […] corporate kool-aid” or “being seduced by a supervillain,” glossing over fairly significant issues of cash-flow and corporate branding in academia. T: Yeah, it can be very difficult to define that corporate-academic relationship. I’m sure it was different in the 80s, but I think one of the most interesting things about the Media Lab model (both a good and bad thing, probably) is that we’re a really well-funded lab generally, which gives students an incredible amount of freedom. The funding model here is set up so that companies have to pay to be members, and membership costs $200K, so really only larger companies can afford to participate. And when you give money to the lab, you actually have access to the IP—so it’s actually set up so that the students have access to their own IP. If, for instance, they want to start a company after they graduate, then they can. But so can the members, so figuring that out is an interesting challenge. At other institutions, if you get funded from a company, they own all the IP of the student. The students pay their dues, so to speak. You come up with the idea, and the company takes it because they paid for it. But that’s not the way it happens here, which is cool. When companies give you money, it goes into a consortium fund, and that fund gets distributed across different groups. And it’s funny—typically, when labs are sponsored by companies, then the companies can say, ‘Oh, we want you to develop X.’ But that doesn’t happen in the Media Lab, for the most part. Companies give money trusting that something interesting will come from it. Sometimes it’s a synergistic relationship where a company is really interested in an idea that happens to align with a certain group’s interests. 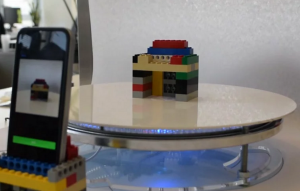 LEGO, for instance, is a sponsor of the lab, but they collaborate with our group in particular. And that’s great for both of us, because they have access to scaling projects in ways that we don’t necessarily do as a research lab–but we’re also doing a lot of research that’s of interest to them on how children learn. For the most part, though, we have a lot of freedom with what we do with the money, which is so unusual, and something I’ve been really thankful for in my time here. No one has ever told me, ‘Oh, this company is now sponsoring the lab, so you have to spend a few months working on this project.’ Occasionally projects will come together based on what corporate sponsors are interested in, but if I join it, it’s because I’m interested in it myself as well. There’s never been a case where I was required to work on something because of the way things are funded. It’s a good way to brainstorm with certain companies too; I know some will post hack-a-thons and specific events to get feedback on something new they’re developing. But otherwise, people in the lab aren’t obligated to work on particular projects due to corporate sponsorship. 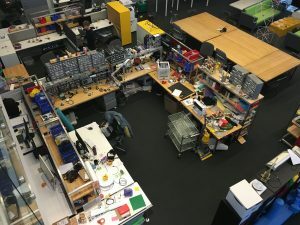 It seems to me that the MIT Media Lab has a lot of flexibility that other institutions don’t simply because we’re now thirty years old and have built up a reputation in the field. And that freedom is incredibly valuable. J: Tiffany, thanks so much for your time. This discussion has been wonderfully enlightening!